India is a complex nation with varied culture and multiple languages. India has the second highest languages(780) after Papua New Gunea (839), according to Wikipedia. But according to readmeindia.com , there are as many as 880 languages in2016 (Total Languages in India -- Past and Present , September 10, 2016). Article 343 deals with official languages. Estimates of the 2001 census suggest that about 41.1% of total population speak Hindi. The Eighth Schedule lists 22 official languages .(constitution.org). There are many dialects of Hindi. Recently, India's external minister said that the United Nations (UN) should adopt Hindi along with other official languages of UN ("India wants Hindi as official language", hindustantimes.com, Jan 3 2018) and is ready to bear Rs 400 crore as expenses. But as Shashi Tharoor rightly asked in Parliament (thehindu.com): What would be the purpose of making Hindi as an official language of the UN? Out of six languages, only two -- English and French -- are working languages used in the UN. It may help the leaders to reach TV audience but not delegates. Since the present right wing assumed office, it has been trying to promote Hindu religion globally. The UN celebration of International Yoga Day started from 2015 also indicates sinister promotion of hinduism globally. The US former president declared Devali as public holiday ( wirally.com) which indicates growing popularity of hindu festivals in America. Though Hindi as a language must be given due importance, it should not be imposed or promoted overlooking other languages. The huge amount proposed to be spent is a waste of precious money that can be used in other productive work. Moreover, Hindi has many dialects. It is often mixed with Urdu in daily usage. 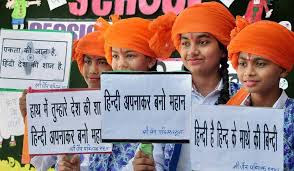 If Hindi is promoted, people of other languages may start agitating to promote their local language. Also, many tribal languages are becoming extinct. It is the duty of the government to encourage development of these languages. India is not merely a ' Hindistan' but a union of many languages and cultures. Hence, the hegemony of Hindi creates sharp differences between Hindi- and non-Hindi speaking population. Equal treatment of all languages is essential in a pluralistic society like India. Hindi and Hindu religion are being viewed as higher above others. They are being given prominence in international forums. This does not augur well in a vast diverse nation like India. The government should work for all languages and people of all religions to foster the ideals enshrined in our constitution.